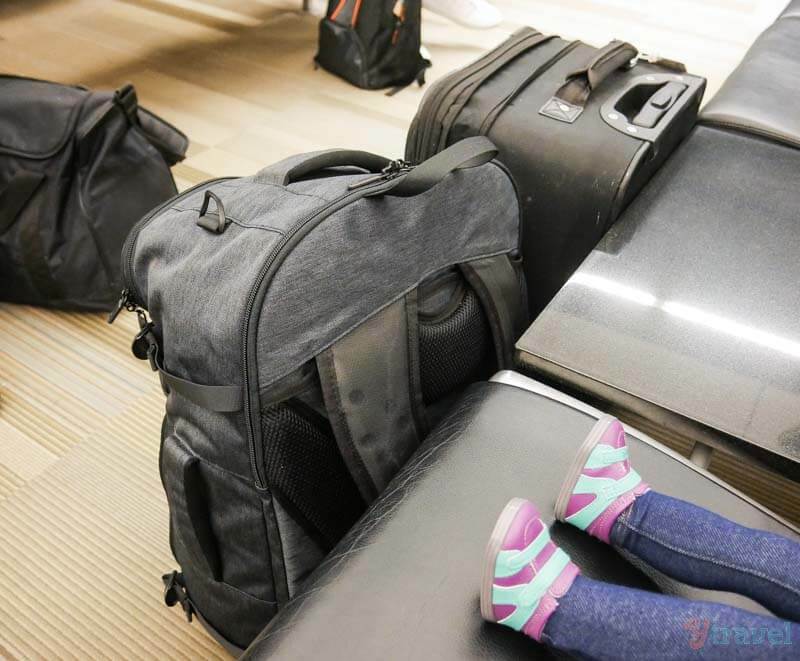 Tortuga Backpack Review: Is this the best carry on backpack? By Caz | December 16, 2018 | This post may contain affiliate links, which means we may receive a small commission, at no cost to you, if you make a purchase through a link. Read our Disclosure. 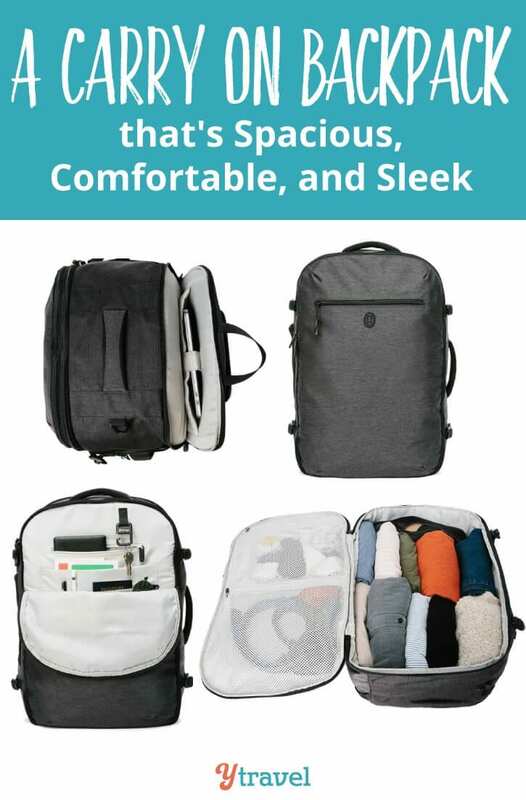 I’m not sure if it is the best carry on backpack, for lack of trying too many others, but I’m pretty sure the Tortuga Setout Backpack checks off most of what you would want in a travel backpack carry on. Since I’ve become a family traveler, I have mostly used suitcases as my travel luggage. I must admit, I do miss the days of getting around with a backpack on my back. It just feels more adventurous and simple. 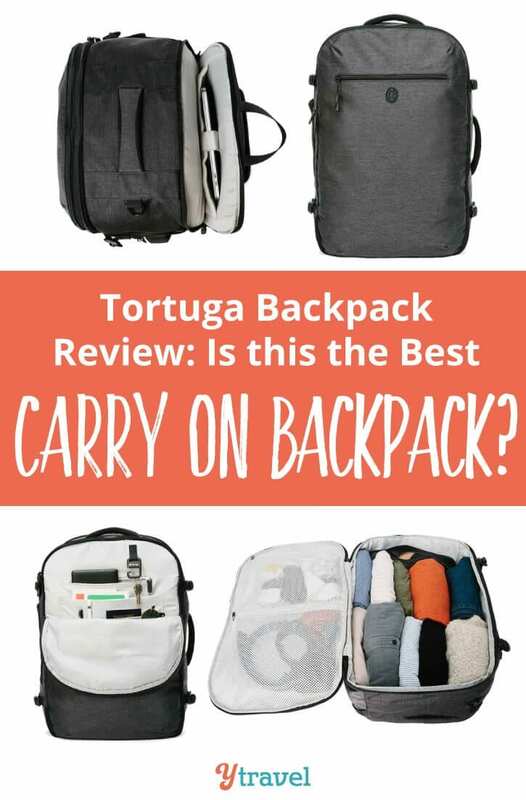 So when Tortuga reached out to see if we wanted to include their new Setout Backpack in our list of best carry on bags, I suggested I test it out myself first. I was under no obligation to post a Tortuga Backpack review, but I’ve decided to as I really love this small travel backpack and am now using it to replace my Delsey suitcase in some travel instances. Living in Australia, I could never understand the carry-on only luggage movement. I was completely baffled as to how on earth people could travel for long periods of time with only a carry on bag. It wasn’t until I loved to the US that I understood. In Australia, your carry on backpacks are weighed and cannot be heavier than 7kg. My laptop used to take up almost all of that weight. As a digital nomad it’s a required travel item! And then I”d arrive at the airport and be stung with a $50 fine for going overweight and be pissed off as I left a lot of things at home that would have helped me have a more comfortable trip. They don’t weight your carry on bags in America. It just has to be of a certain size – a quite generous size if you ask me. Once I understood that, the whole concept of carry on only luggage became very attractive. Enter the Tortuga Setout Backpack to be the best carry on backpack to do this for you! I first used the carry on backpack from Tortuga to visit Chicago on a Mummy Daughter date with Kalyra. We were flying in the chilly winter months, so definitely needed more clothing (and shoes) to pack etc. I wasn’t sure the small carry on bag would do the trick. But it was only for the weekend so we were determined to make it work. It made for effortless travel. 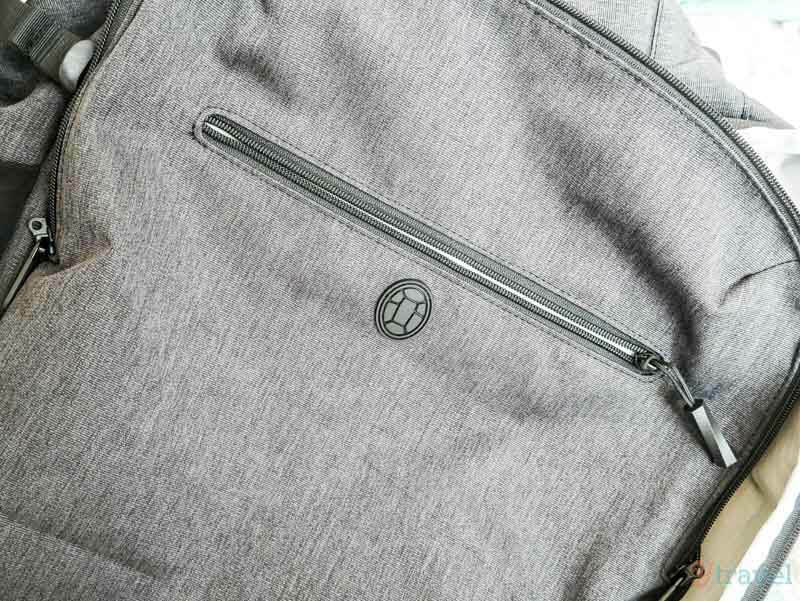 I’ll go through the features I love of the Tortuga backpack in a moment. But, I loved it so much that I then took it on several of our road trips. It’s great for flying, but it’s also makes road trip luggage and easier experience that takes up less space in your car. 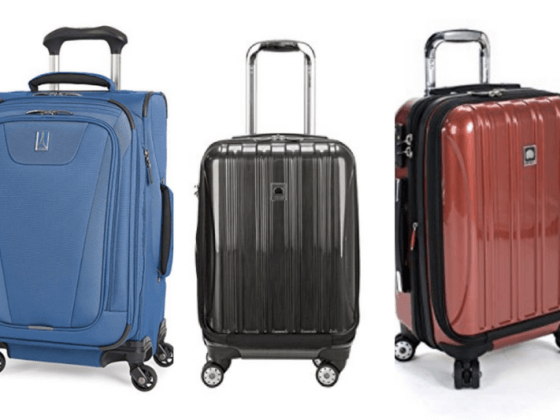 It’s definitely now my luggage of choice for short getaways, particularly for city stays, as well as road trips and travel in the warmer months. Tortuga Backpacks was created by Fred Perrotta and Jeremy Michael Cohen in 2011. They learned on their own backpacking travels around Europe that it was hard to find a perfect bag for city travel. So they made their own! I love that their mission is to help you live on your terms. They understand the travel market because they are travelers. As a result, their products are modern, innovative and actually help support travelers needs. I really like the company and am now an avid supporter of them. The Tortuga Setout Backpack was released in November 2017. It’s the latest backpack from this innovative luggage company. I knew Tortuga was a reputable, young, modern company from the many backpackers and travelers I know who rave about them. For that reason, I was keen to test out the bag and share it with you. I loved my backpack when I backpacked through Europe and South East Asia for what it represented. But, it was no where near the comfort and quality of the Tortuga Backpacks, nor was it as affordable as the Tortuga Setout. Other travel packs they make include the Tortuga Outbreaker, travel duffel bags and travel daypacks. As mentioned, the standout feature of the Tortuga is that you don’t have to bother with checked luggage. It’s so nice to walk off the plane and straight out the door. No more hanging around luggage carousels waiting, and waiting and waiting. The luggage carousels seem really slow in delivering checked bags in America, and the only time I’ve had delayed or lost luggage is in the US. It made it that much easier traveling with kids as well. Not to mention avoiding checked in baggage fees! I’ll take that extra $50 for our shopping spree on the Magnificent Mile thank you! It does make me line up to board earlier so I can ensure I find room in the overhead luggage. It’s material and malleable shape make it easier to fit into the overhead compartments and I was quite surprised at how small it actually looked when it fit snugly in. I’ll admit, I was nervous boarding the plane for the first time, thinking that it couldn’t hold that much inside and still fit in the overhead bins. They were not lying when they told me it would. I think sitting on your back inconspicuously also means it won’t be noticed as much as rolling suitcases when the airlines are looking to check people’s carry ons in as the flight is full. As I was using the carry on backpack as my personal bag as well (more on how you can do that below), I really did not want my carry on to be flagged for check in. This could be a potential problem if it is also used as your all in one bag. Traveling carry on only means you can only pack toiletries and fluids less than 100mls. Don’t forget as it will be taken from you when going through security. As I rarely travel carry on only, I completely forgot about the rule when packing my brand new bottle of shampoo in my backpack! 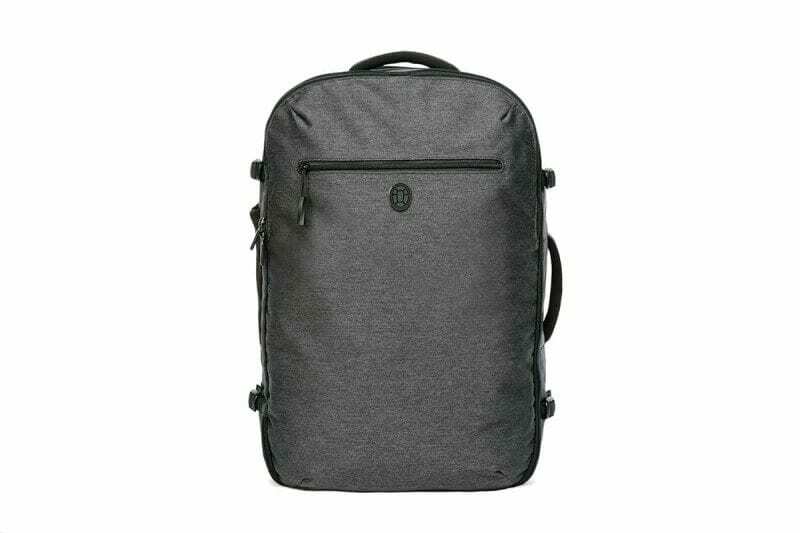 I think this Tortuga backpack is perfect for city travel. 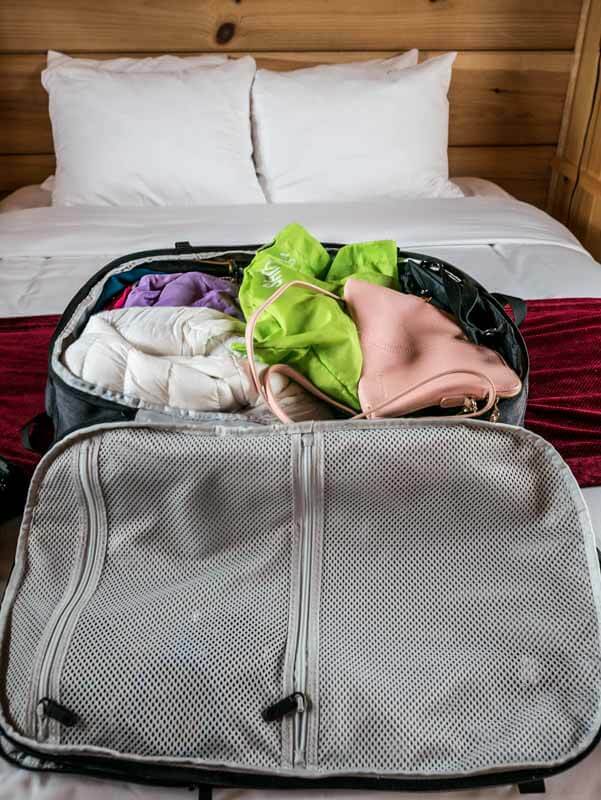 It can be a headache rolling a suitcase around busy streets, especially if they have uneven suitcases and many legs that can trip over them. You can also easily take the stairs and manage hilly streets with a backpack. It made it easier to get around and keep an eye on Kalyra. Those comfortable padded shoulder straps will make all the difference! This is the kind of backpack you want to travel around Europe with. The sleek rounded shape and grey water resistant fabric means it doesn’t stand out, which is perfect for city travelers wanting to blend in. I loved the feel and look of the backpack. The material is very soft, which I have not found in a backpack before. 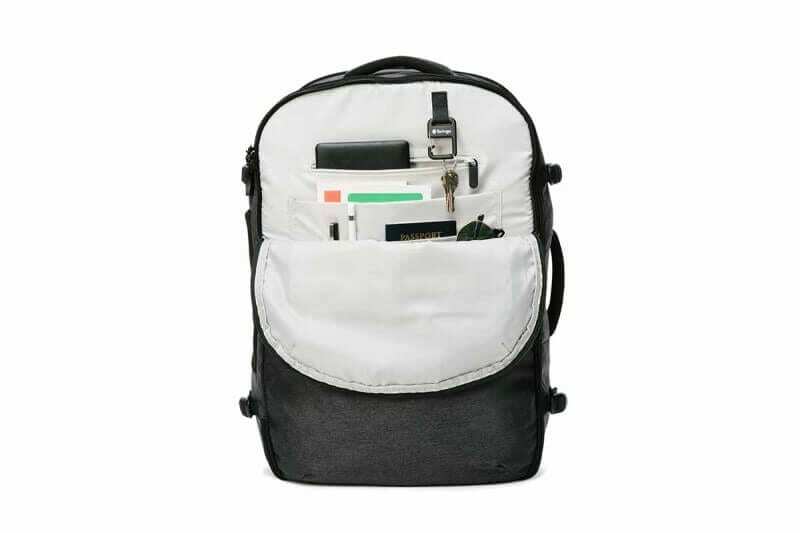 The backpack has been designed with lots of pockets, some hidden, giving you great scope for organization. 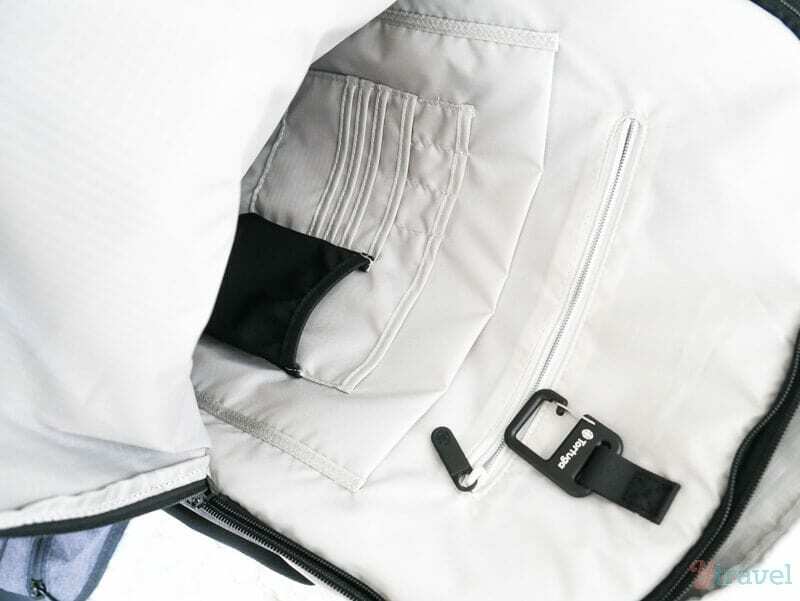 You can also tuck the shoulder straps in for protection when carrying your bag down the aisle of the plane or when stowing it in an overhead bin. And if you also ever do want to check it in. Sometimes I do just want to check luggage in so I don’t have to deal with carrying it around while waiting for my plane. For specifics it is made from 900D heathered polyester and is weather resistant. I think this carry on travel backpack is great for women especially as it is super comfortable to carry and molds to the shape of your body. The padded strap and hip belts takes the strain off your shoulders by transferring 80% of the bag’s weight evenly to your hips. It has a padded side grab handle, along with multiple compression straps to better disperse the weight load. There is a shoulder strap attachment, so you can carry the bag like a duffel when the backpack straps are stowed away. This strap is not included however. The injection-molded backpack straps conforms to your body and makes the bag more comfortable to carry. As it is carry on dimensions, it does mean you pack less so it is not very heavy on your back. It’s so important to have a backpack that disperses weight and is kind to your body. The Setout Backpack is the style of backpack I have always preferred and mostly used. It’s a front loading backpack, which means it opens from the side, like a book, to make packing easier. It’s SUPER helpful if you want to quickly get something out of it. I do not like top loading backpacks at all. I owned one once and never again. I have no idea why they even make top loading backpacks. It’s a hassle and a chaotic mess when packing and when quickly trying to get something out, like a long sleeve T-shirt because the AC is freezing. The internal packing space is larger than I anticipated. I was surprised how much I could fit in. You can organize it with packing cells, although mine felt too bulky. I could not use my underwear organizer as it was too bulky. But given, it was a short trip, it wasn’t really necessary anyway. However, I did find the space a little challenging given that we were traveling during the cold Chicago months. I hate being cold and tend to overpack when traveling during winter. I also don’t have great lightweight warm clothes and I like to take a few different pairs of shoes. A girl has to travel with her cowgirl boots in the winter, right? 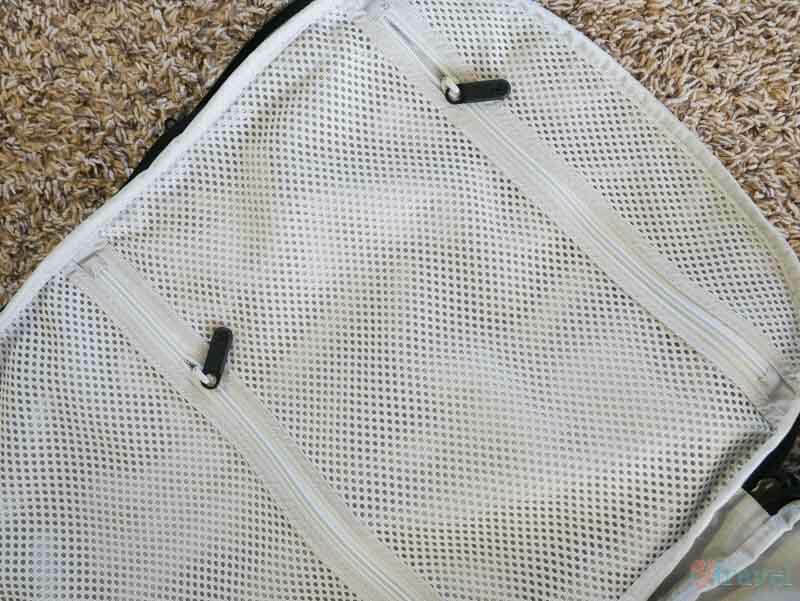 There are zippered mesh pockets on the inside as well which helps to make organization that much easier. It’s great for those items that can get tangled or lost easily like cords, underwear, accessories and socks. We wanted to take just the Setout backpack for Kalyra and I, but soon realized that was not going to happen, especially since we knew we’d be shopping along Magnificent Mile. The backpack is great for short term travel – perhaps a week, or more if you are a great minimalist person. If I was 22 again, backpacking through South East Asia, with only summer dresses, sarongs and flip flops, this would absolutely be the best travel backpack for me. 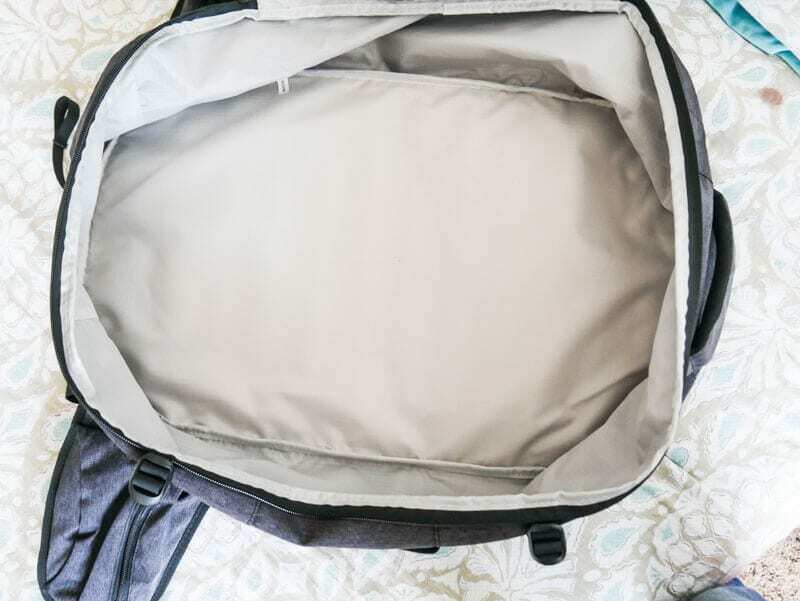 Tortuga also designs packing cubes that fit perfectly within the Setout Travel backpack range. See more here. 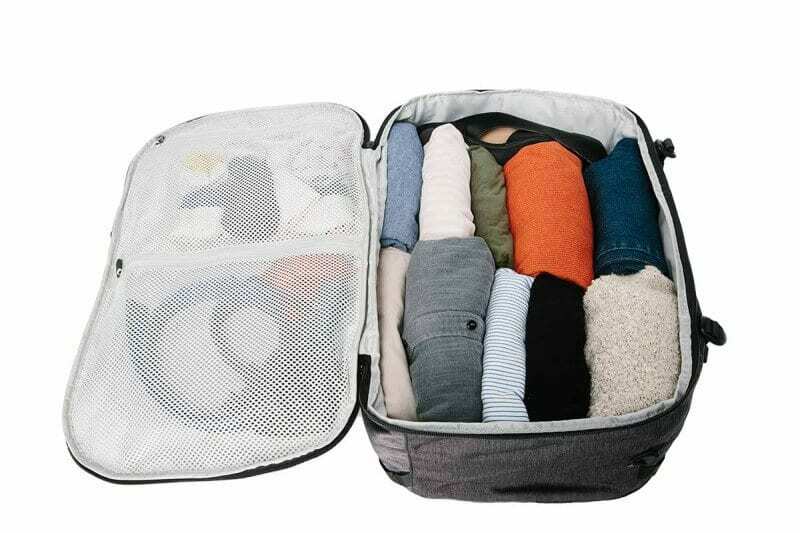 Check out this underwear organizer to help save your packing sanity. I loved how I could use the Tortuga Setback backpack for my clothes as well as my personal items making it a contender for the best carry on backpack. I only needed the one bag. There are two compartments for carrying your personal effects. They are so well hidden in their design that I didn’t even notice the back laptop compartment until I used the backpack for the second time on our road trip. I was stunned when I saw it – how did I miss that? Kalyra and I had quite the chuckle. 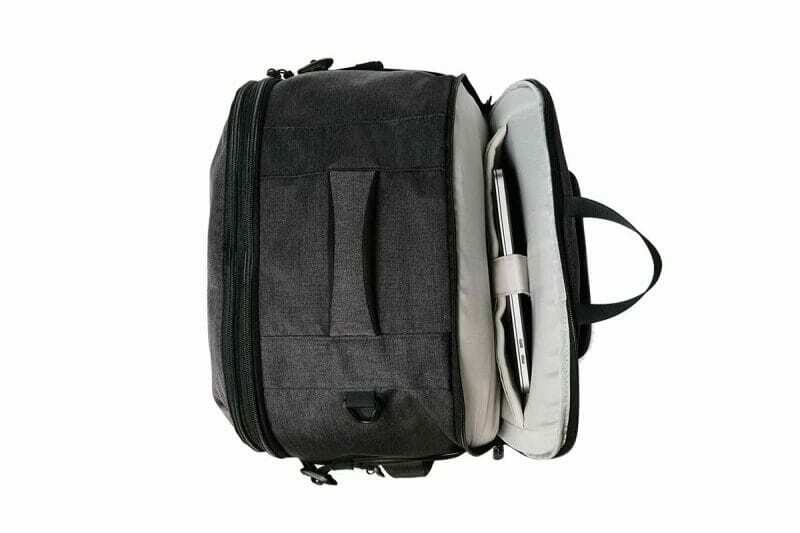 The back electronics laptop sleeve is perfect for your laptop as it is sturdier and sits flush against your back. As mentioned, it blend sin well to the rest of the design!! The front electronics department is perfect for your eReader, tablets, journal, reading book, pens and nick nacks. The Setout safely holds a 15” laptop, a 9.7” tablet, and an ereader. I loved being able to stash my phone and boarding pass in the hip belt pockets while en route. It’s effortless and reduces my need for another bag, or to keep taking the bag on and off my back to access important docs. It also had a side pocket where I could put my water bottle. I love having easy access to water when I travel. Got to stay hydrated. 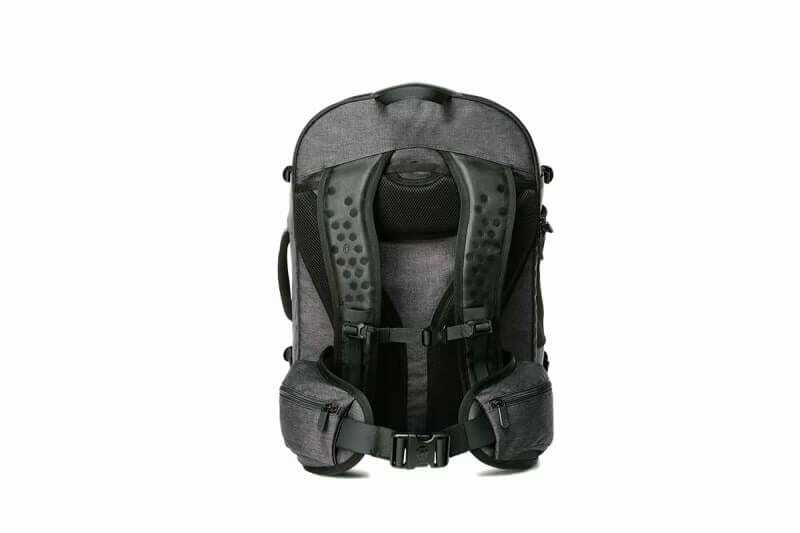 The Setout backpack costs $199 which includes free shipping in the US when purchased online here. I think it’s a great price for the high quality of the bag and the ease it offers for travel. 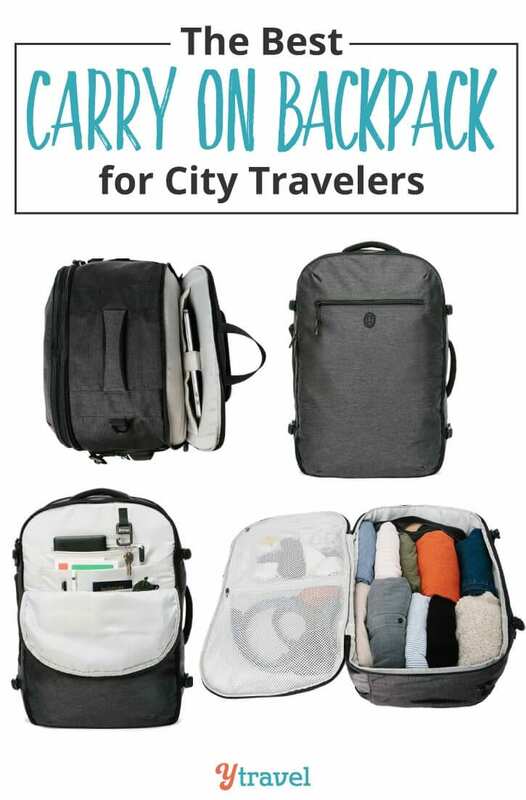 I’m sure you’ll discover it is the best carry on backpack for modern day city travelers. Are you a carry on backpack fan? What’s the most important feature of your carry on luggage? Great blog! Now how about backpacks for kids that can be used both for travel and in school? Specifically for school backpacks… but I think the best school backpack will be good for travel as well.